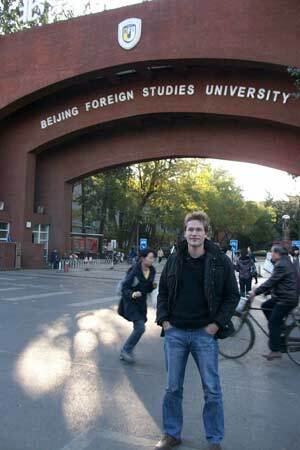 Malte Rasch, a student from Germany, fascinated by China's exotic culture and rapid economic development, began studying Chinese language after completing his doctorate, because he thinks the best way to get to know a country and its people is to learn its language. He has been studying Chinese at Beijing Foreign Language Studies University (BFSU) for three months and plans to continue his studies until next June. Before he came to China, he had attended intensive Chinese classes for about three months in Germany. Malte says Chinese is not easy, but he likes it because Chinese characters are so different from any other language. He is fascinated by their enigmatic forms and loves trying to decipher them. He can write quite a few characters but reading remains difficult because he can only recognize 50 percent of the characters in an article. But he can speak simple Chinese and his pronunciation is quite good. He enjoys learning Chinese. There are only eight students in his class, so everyone has the opportunity to talk and participate in class activities. They sometimes sing and dance together with the teachers. Chinese pronunciation puzzles Malte: The same word pronounced in a different tone may have a quite different meaning, for example 练习 "liànxí" (practice) and 联系"liánxì"(contacting someone), 请问 "qǐngwèn"(May I ask…); 请吻 "qǐngwěn"(Please kiss…). Malte's scholarship allows him to attend an internship program. Each week he goes to visit some German-Chinese joint ventures in the Chaoyang District. He has discussions with the staff and attends lectures on doing business in China. He has made many Chinese friends and friends from other countries and often goes out with them to bars in Sanlitun or Wudaokou. They also do sports together, such as playing tennis and basketball. Malte is particularly good at badminton and is taking part in badminton tournament for foreign students in Beijing's universities. Four years ago Malte took a three-month trip around China. He visited many places, such as Hong Kong, Sichuan, Lanzhou, Dunhuang, Qinghai, Kashgar and Tibet. He has also climbed some of China's famous mountains such as Emeishan, and Huashan; this time he hopes to climb Taishan and Huangshan. 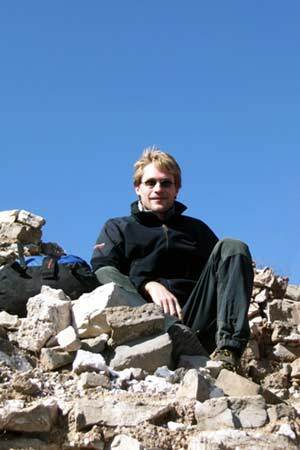 Of all the places he has visited, Malte loves Dunhuang most because it is a combination of breathtaking natural beauty and history. "Distant hills, lush green fields and trees, all placed right in the middle of a sandy desert. It's like an illustration in a picture book to explain to children what the word 'oasis' means," said Malte. He said the Mogao Grotto is one of the most beautiful and spectacular places he has ever visited. This year Malte went to Yunnan during the National Day Holiday. There he met a nice Yunnan girl. He and his friend met her with on a small bus, which they had thought would take them to a temple they were planning to visit. It turned out that they had taken the wrong bus and got completely lost. But the girl came to their help, took them to the temple and then accompanied them to many other places in Yunnan. The Yunnan girl speaks neither German nor English but she had enough patience to communicate with Malte and his friend in Chinese. She had to speak very slowly to make sure that they could catch what she is saying. They got along so well that they still keep in touch. During his trip to Yunnan, Malte was disappointed that he could not understand Yunnan people's Chinese at all. He even doubted whether they were speaking Chinese. But he was very happy that Yunnan people could understand his Chinese. Although he has only lived in Beijing for three months, Malte knows his way around quite well. He knows to go to Zhongguancun to buy electronic equipment and to Xizhimen and Beijing Zoo to buy clothes. He has also learnt how to bargain. He enjoys shopping at the Beijing Zoo Clothing market because clothes are very cheap. He has also noticed cultural differences between China and Germany. He finds it easy to get to know people in Beijing. For instance, he often talks to strangers on the street. If he sees some old folks playing chess, singing or dancing in a park, he can just say, "Can I join in?" and they are happy for him to get involved. He is not embarrassed at all because it seems quite ok in China. But in Germany strangers do not want to have anything to do with each other. Another big difference is the food. Chinese food differs a lot from German food. But Malte loves Chinese food, especially spicy food. His favorite Chinese dish is a Xi'an specialty, Yangrou Paomo (a mutton soup served with wheat flour flat bread). In Germany, people value their privacy. But in China, people like to hang around together and they do not care so much about privacy. And, says Malte, Chinese students work much harder than German students. They study till 10 o'clock in the evening, while German students usually go out partying at night. But according to Malte, Beijing still has a long way to go. For instance, the metro only covers a few areas of the city so he often has to take taxis. And compared with German cities, Beijing does not have much in the way of green spaces. There are wide streets and huge concrete buildings everywhere. He loves the Summer Palace, but it is always crowded on weekends. Despite his gripes, Malte says on the whole life in Beijing is good. There are supermarkets, restaurants and sports facilities within walking distance of his lodgings, and Beijing's many bicycle lanes make cycling safe. Malte says he will stay in China for at least another year. After finishing his studies he plans to look for an internship in an international or German company. After the internship, if he can get a decent job, he may even settle down in China.